About 600 Myanmar protesters on Thursday demanded compensation from the Sino-Myanmar operators of dual pipelines in western Myanmar’s Rakhine state for land they confiscated for the massive and controversial project RFA reported. 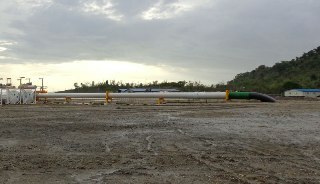 The U.S. $2.5 billion Shwe pipeline project and deep-water port, which transports oil and natural gas from the country’s offshore reserves overland to China, has been dogged by complaints about little or no land compensation along with a loss of livelihoods for local fishermen. The protesters from Ann township in Kyaukpyu district demanded that Chinese state-owned oil company China National Petroleum Corporation (CNPC), or PetroChina, and Myanmar’s state-owned Myanma Oil & Gas Enterprise (MOGE) pay them for land they had to give up for the pipeline project.